I received a phone call yesterday from an Ohio landowner asking what was "killing" his Eastern white pine (Pinus strobus) trees. Coincidentally, when my cell phone rang, I was driving past a row of white pines with several trees looking pretty ragged owing to their normal shedding of inner needles at this time of the year. Although normal, it can sometimes be dramatically synchronous with all of the inner needles turning reddish-brown at once. Of course, I asked a few questions to make certain the "problem" was indeed normal. It's easy to jump to conclusions during an over-the-phone diagnosis or with an e-mail question that doesn't include pictures. 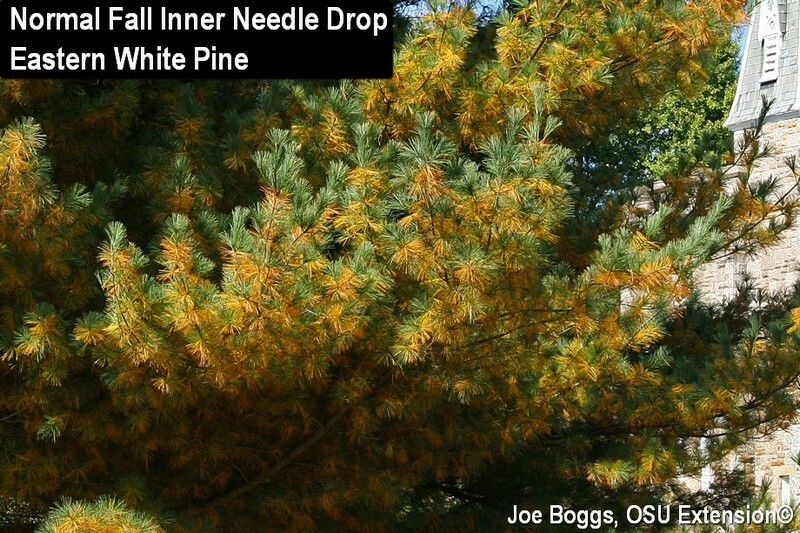 White pines and other conifers can struggle if soils have a high pH (= alkaline) or if they are poorly drained owing to soil compaction, high clay content, or other issues that interfere with water infiltration. It's important to ask exactly which needles are turning yellow and when did the color-change occur. It's normal at this time of the year for white pine needles on last year's growth to turn yellow and shed while needles on this season's growth remain a nice healthy green. It's not normal if the inner needles turned yellow in July. If that occurred, follow-up questions should focus on assessing overall plant health such as measuring yearly growth rates which is pretty easy on conifers; yearly stem growth starts and stops with the lateral whorls. Short growth rates point to a serious plant health issue(s). I learned from my questions that the landowner's white pines were indeed showing normal fall needle yellowing and shedding. However, he remained skeptical until I asked where did the old needles come from that littered the ground beneath his healthy trees? Each fall, normal seasonal needle yellowing and shedding on white pines and other conifers can come as surprise to many, as does the springtime yellowing and shedding of the foliage on American holly (Ilex opaca) and yews (Taxus spp.). "Pines have earned the reputation of being 'evergreen' by the same device that governments use to achieve the appearance of perpetuity: overlapping terms of office. By taking on new needles on the new growth of each year, and discarding old needles at longer intervals, they have led the casual onlooker to believe that needles remain forever green." "Each species of pine [and spruce, and fir, etc.] has its own constitution, which prescribes a term of office for needles appropriate for its way of life. Thus the white pine retains its needles for a year and a half; the red and the jack pines for two years and a half. Incoming needles take office each June and outgoing needles write their farewell addresses in October. All write the same thing, in the same tawny yellow ink, which by November turns brown. Then the needles fall, and are filed in the duff to enrich the wisdom of the stand. It is this accumulated wisdom that hushes the footsteps of whoever walks under pines."